Just a few hours ago a series of earthquakes, including one of 7.7 magnitude, occurred south of West Java, Indonesia. A tsunami struck the region resulting in property damage, injuries and death. Death tolls have been climbing in news reports. Here's a news report from the BBC. 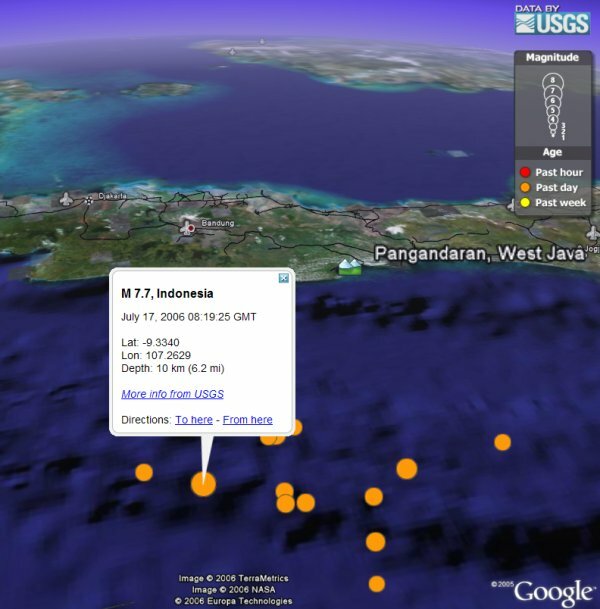 Initial reports of the tsunami were in Pangandaran which according to a quick Google search is located here . You can see current data on seismic activity from the USGS earthquake monitoring network link here. The earthquake data is positioned over the center of the disturbance, colored by how long ago it occurred, and the size indicates the magnitude. Wow...updates of 'quakes within an hour! This is an amazing program. Thanks for the link. And just half an hour before I downloded this file, a mag 5.1 goes off in the same region! Great blog Frank. I learned about the quake happening here instead of on the news. Lets hope no tsunamis are as bad as that Xmas one a couple years back. Finally I found a service that should have been in place years ago due to our technically capabillities. Unfortunately it has to appear first with lot's of damage until something happens. This is a great site, but I need more information on how the tsunami formed and what made it happen.